Doors from our "Cutting Edge" product line consist of the E-S (standard), E-P (premier), E-F (fire rated) and E-I Insti-lite (institutional) series. Standard 5-3/4" x 2" frames to be typical for each series. Products are fabricated utilizing fiberglass pultrusions. Stile and rail type construction allows us to produce high quality units of any configuration, in a short amount of time. Stiles and rails are bonded to the face skins and core material under pressure until fully cured. Doors and frames weighing in at only 6 pounds per square foot total, they make for an easy install. 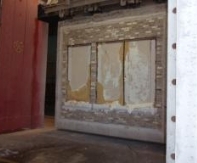 Door edges are completely sealed from the elements. Lock stiles are furnished with a three degree bevel to ensure a proper fit. -Beveled lock stiles - 1/8" in 2"
-Factory pre-finished, choice of 30 standard colors. Also available with custom colors. -Lifetime corrosion warranty - 10 year workmanship warranty! Hard to install lite kits are a time wasting headache that you don't need on any jobsite. Edgewater FRP doors come standard with simple to install PVC lite kits. These are secure from the outside with no exposed fasteners. Lite opening shall be completely sealed utilizing fiberglass pultrusions, integrated into the units sub-frame during construction. 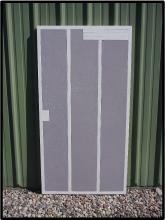 Sight-proof fiberglass louvers are available with or without bugscreen. 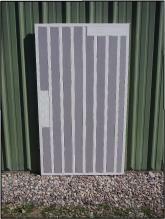 Stationary louvers are manufactured utilizing fiberglass inverted "V" blades. Louver openings shall be completely sealed in the same manner as lite openings. Why should your installers have to drill pilot holes for templated mortise hardware? Well, they shouldn't - we feel this step should be done at our facility. Any hardware preps mortised into the door and/or frame come factory pre-drilled so your installers can hang doors quickly. Frames will be factory drilled for anchoring fasteners as well.